Reliable repair and maintenance services for your NJ hot water heater. Are you looking for a reliable hot water heater company in the LBI and Ocean County, NJ area to repair or maintain your unit? Whether you have a gas or electric hot water heater or a tankless system, we can provide you with the repairs or maintenance you need. Since 1999, Air Tech continues to provide residents and businesses throughout the Long Beach Island and Ocean County areas with a variety of hot water heater services, including repairs, emergency repairs, maintenance and installation. All of our technicians are licensed plumbers; when it comes to hot water heater service, Air Tech has the experience and expertise you’re looking for. 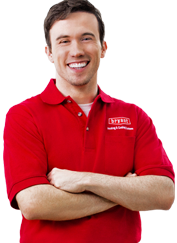 We provide both residential and commercial plumbing services and work with all makes and models of water heaters. At Air Tech, we’re NJ homeowners too. We know that emergencies don’t conveniently occur Monday through Friday, 9 a.m. – 5 p.m. That’s why we offer reliable emergency hot water heater repair 24/7, even on holidays to provide you with relief as fast as possible. In most cases, water heater emergency repairs can be resolved same-day. If disaster strikes, don’t delay. Give the Air Tech professionals a call today. It’s always best to know the serial number and make/model of your water heater before you call so we can identify the unit’s age, warranty and be aware of any other pertinent information about your existing water heater. You can typically find this information on a large sticker on the side of the water tank. Annual hot water heater maintenance is recommended to ensure your unit is running efficiently and prevent major emergencies down the road. The best time to schedule your annual hot water heater maintenance appointment is typically right before the onset of winter. What should I do if I don’t have any hot water? This is one of the most common water heater problems. No hot water… or too little of it. If you experience cold water when you turn on the hot faucet, most likely the problem is due to a pilot light that has blown out. This is usually because of a faulty thermocouple or a pilot control valve gone bad. Why is my water lukewarm? Typically, a water tank that produces lukewarm water is because the thermostat on the tank is set too low. Be careful not to turn the temperature up too high, especially if you have children in the house, as it can be a scalding hazard. For reference, the Department of Energy recommends having your hot water heater set to 120 degrees Fahrenheit. Why is my hot water heater making strange noises? No, your house isn’t haunted. If you hear cracking or popping noises coming from your hot water heater, it could be because the water heater tank has sediment or scale build up (minerals from hard water). The solution? The tank should be drained and flushed. Can’t I just DIY my hot water heater repair? Sure, you learn how to DIY just about anything on YouTube, but we don’t recommend it. Water heaters are tricky and potentially dangerous if repairs are not executed properly. We advise working with a trusted plumber to handle these jobs. At Air Tech, all our certified technicians have years of water heater experience before they ever step foot into your home which means they’re qualified to get the job done right the first time. At Air Technical Service Heating, Cooling and Plumbing, we offer hot water heater repair and maintenance services throughout LBI and the surrounding areas. Since 1999, residents and businesses have trusted our qualified technicians to get the job done right the first time. If you require hot water heater repairs or maintenance or are interested in installing a new unit, call Air Tech today!